Since 2001, the company has posted a series of gag products on its site, everything from the World's Largest Remote Control Car, a standard-sized car with its own toy-like remote, to a Monolith Action Figure a la Stanley Kubrick's 2001, a rectangular black "figurine" of the shapeless villain with absolutely no moving parts. The joke? None of the products actually exist at least initially. Once customers click on the prices, they find themselves on an April Fool's Day page, a punch-line the company won't ever tire of. Nor should they. In 2010, ThinkGeek did $76 million in sales, a 55% jump from 2009's $49 million and up from just $19 million in 2005. Year round, the site pumps out tangible products like t-shirts with built-in playable instruments and retro gear for your electronics like an attachable iPad joystick or a universal electronics charger that rests on your wrist like a watch. The geek set appeal is obvious, but for some of the company's zanier ideas, the April Fool's Day line provides a perfect testing ground. "Geeks hate to be advertised to like they're idiots," says Ty Liotta, Think Geek's senior merchandiser. "They tend to be someone who is probably more intelligent than the average person. They'll see right through a bunch of marketing mumbo jumbo." And so in place of mumbo jumbo, there are pranks. Why not send your friends a link to a PC EZ-Bake Oven for a good laugh? It's the best viral marketing a company could ask for. For every "product" that makes it to the site on the big day, there are countless others that don't make the final cut. Facebook co-founder and CEO Mark Zuckerberg, for instance, was almost offered up this year in the form of a plush doll. But the company nixed the idea in the end. "It was just too complex," co-founder Jen Frazier says, explaining the hitch of a huggable Zuck. "Much like Facebook itself," says Willie Vadnais, another ThinkGeek co-founder. Instead, customers will be sending around links to ThinkGeek's own Playmobil Apple Store Playset and Angry Birds Pork Rinds. 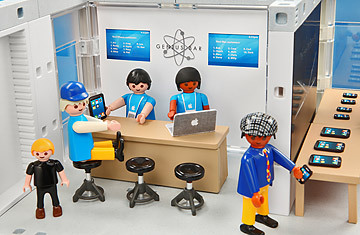 The Playmobil set, a mini Apple flagship store, comes standard with Playmobil Apple employees and a Steve Jobs to deliver inpromtu keynote speeches. You can even pop your iPhone 4 into the side of the set to use as the store's flat screen display. An add-on set includes dozens of Playmobil people to line up outside your store for Apple's next product launch. Though the set will amuse Apple enthusiasts, it's the De-3D Cinema GlassesLiotta says might really catch on. Lightsaber popsicles, Arsenic-based sea monkeys (think: NASA's recent discovery of Arsenic-based life) and a chocolate zombie bunny are also in this year's lineup, and if past years are any guide, at least some of those fake products will end up real. Last April 1, for instance, the virtual geek one-stop-shop introduced Canned Unicorn Meat into its product lineup. After a deluge of feedback from customers begging the company to actually make the unicorn meat, it obliged, and the product sold out within weeks. But the National Pork Board wasn't amused. It delivered a 12-page cease and desist order to the company, citing it was poaching pork's trademarked slogan with its tag line: "The New White Meat." "We'd like to publicly apologize to the NPB for the confusion over unicorn and pork," the site read. "And for their awkward extended pause on the phone after we had explained our unicorn meat doesn't actually exist." And this wasn't even the only hiccup. In November, German customs officials confiscated an airline passenger's faux unicorn Spam, classifying it as the attempted transport of "meat of a rare animal." For their part, animal rights groups protested the very existence of cans of the fake meat of a fake mythical creature. But for all their April Fool's Day enthusiasm, there's rarely a prank inside the ThinkGeek office on April 1. There's never been any April Fool's office pranks that I can recall," Liotta says. "We're all too tired."